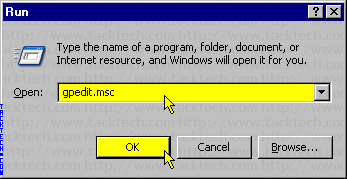 Change Internet Explorer 6.0 Browser Title Text using Group Policy (Internet Explorer 6.0) - TACKtech Corp.
Create/Change the provided by text which appears on the Internet Explorer 6.0 title bar. Note: Internet Explorer 6.0 and Windows XP Professional required. Type gpedit.msc into the Open: textbox. Double click Browser Title in the right pane. 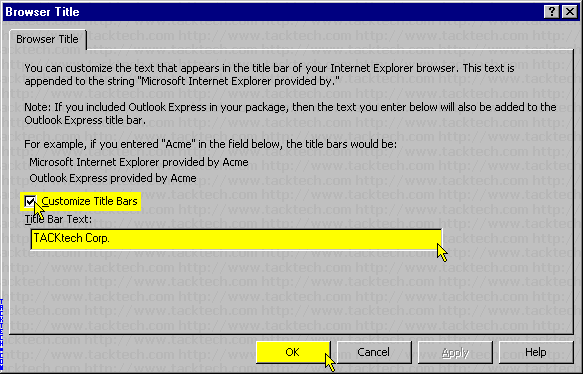 Check the Customize Title Bars check box. Enter your custom text into the Title Bar Text: text box. Open Internet Explorer to view the results.